Two young family members have November birthdays and so I decided to make some handmade gifts. First, the 3-year old wanted a bag to carry toys around in. After some consultation with my SIL, I decided to use some Heather Ross Far Far Away fabric and coordinating solids to make a bag with some fussy cut unicorns. I looked and didn’t find anything I liked as far as a pattern so I’m making it up as I go, though it’s heavily influenced by the QAYG Guild Bag (though with all different sizes). This is my first time doing QAYG and it’s definitely fun. I did a little (bad) FMQ on the unicorns and the wavy lines were done with the regular presser foot. Here are shots of both sides of the bag and both sides of the lining (the lining is inside out at the moment in preparation for assembly). The color is more true in the first one – oh, the perils of taking photos in my basement at night. I’m very close to being done; I just need to make the strap and then the final bag assembly. But since Davy gave me a wicked cold and I’m still feeling crummy from a night tossing and turning I’m going to do the smart thing and finish it when I’m not exhausted and prone to making dumb mistakes. The 8 year old is very into Harry Potter and requested a stuffed animal so I’m making an owl to look like Hedwig. The pattern is a free one called Obligatory Owl, and details of yarn etc are on my ravelry page. I just got the eyes yesterday so I still need to knit the beak, feet, and do the assembly but we’ll call this one 80% done. I’ve been doing a lot of knitting lately but one thing I did make was a Halloween costume for Davy! He’s been really obsessed with horses lately (if we forget to put away the computer or ipad he will point to the screen and demand “Neigh!” videos). 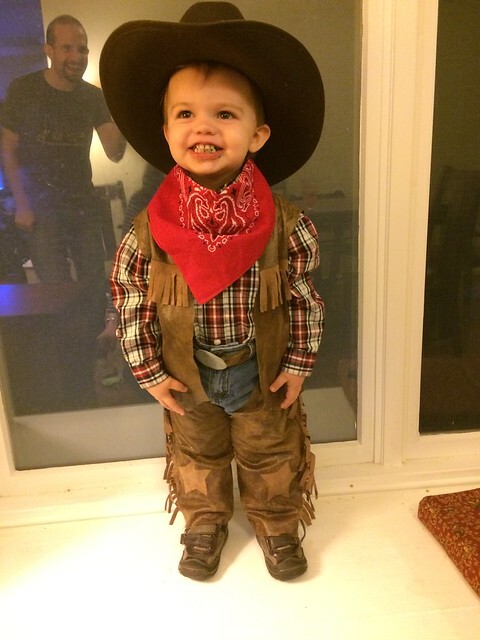 So I thought it would be adorable to dress him up as a cowboy. 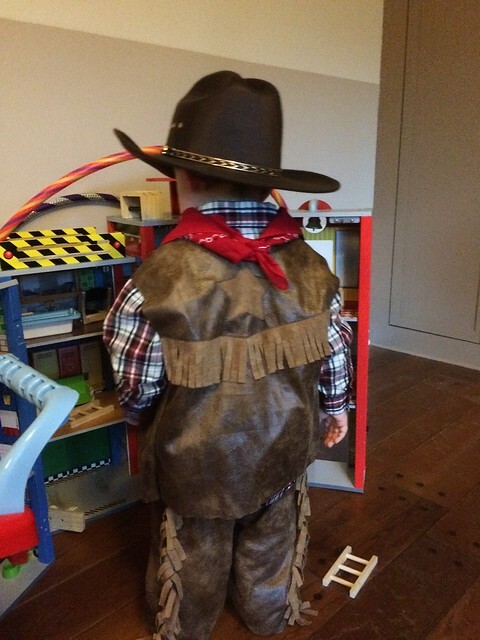 I am fully aware that next year, when he will be nearly 3, he might have his own opinions on costumes! I also know that homemade sometimes can cost more but I really love the look of it. 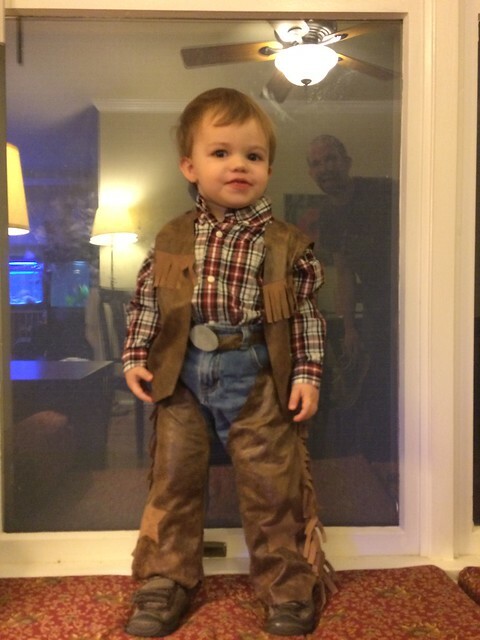 So luckily, I found an awesome tutorial for Cowboy chaps and vest. Looked totally doable! I scored when I went to buy fabric – I found two different costume faux suede microfiber fabrics in the remnants bin. The main fabric cost I think $6, and it has an awesome weathered look to it. So here is Davy modeling his costume! In addition to the vest and chaps, I made him a little belt (since he doesn’t actually own one) and I used some foam to make a belt-buckle with an illustration of a horse’s head on it. My little cutie pie! It was really very easy to make and I’m so glad I did it. It’s a little big so I’m hoping it will do double-duty as an outfit for playing dress-up. He enjoys wearing the hat so that’s getting a lot of use already, and I’m glad we sprung for a slightly nicer hat instead of a pretend foam hat. Trick-or-treating was a little overwhelming for him (all 3 houses we went to) but he enjoyed being all dressed up and handing out candy. I haven’t posted about the Charity Baby Quilt because I have made exactly zero progress on it. I want to FMQ it, and I haven’t done it, and so I’ve decided to take a class at my LQS. So it is on hold until then. In the meantime, I decided to start a new quilt project (So much for that “one project at a time” thing I was attempting). My MIL and FIL were visiting in June and my MIL bought me a jelly roll of Hubba Hubba as a hostess gift (yeah, she is awesome). So I decided to bust into that and see if I could size up the Modern Crosses pattern from Modern Log Cabin Quilting to use with the 2.5″ strips. I think it looks good, and if I did my math right I should come out of it with a nice large quilt – twin to full, depending on how many crosses I end up doing. I spent a bunch of time cutting my center squares and strips out of my neutral fabric (Kona White) and getting them assembled into sets of 4. I’m pleased with how they are coming out so far. I definitely need to work on my precision and my 1/4″ seam but I think I am getting better, and hopefully the less-than-perfect parts won’t be noticeable once it is finished and quilted. My favorite little helper – he picked up his sit & spin, carried it into the little space behind my sewing chair, sat on it and just happily spun around for awhile. Toddlers are so funny. And no, I don’t actually get quilting/sewing done while he is in the basement with me – at most I can do some pressing and cutting, but he is fascinated by my sewing machine and wants to push all the buttons and grab the knee lift and stick his hand under the needle. So the cover stays on and the machine stays off when he is around! But he’s just so darn cute I don’t mind. I’d hoped to get another post together on Wed but since that didn’t happen I’m linking this up with WIP Wednesday! I wrote this originally when I first made the hat, nearly a year and a half ago, but it’s too cute so I’m still going to share. First off I will say that I had a ton of hats for Davy when he was an infant. Knitted, crocheted, stuff I made, gifts, as well as a bunch of cotton knit hats that came with various outfits. He hardly ever wore them, even though he was born in December, because he rarely left the house – no daycare since Gregg stayed home with him for the first year, and it was such a bitterly cold winter that Davy and Gregg pretty much stuck to the house where a hat was too warm. But. I saw the Ogre Babies! pattern and had to have it. The pattern is sized for a newborn and has you using worsted weight yarn with size US3 needles for the body; I used size US4 with worsted weight and it fit him great when I first made it as a 3.5 month old (though he was a long, skinny baby). I think we were still able to put it on his head at a year, though he was in a “no hat” phase and immediately ripped it off. The best part is that I had the yarn on hand already in the perfect color, so it was a great way to use up some scraps. The ear bulbs were a bit fiddly but not too bad, and I think they look pretty perfect. It was also a very fast knit – I think less than a week, and I was not exactly getting a lot of knitting time at that point! Definitely recommended.